The first time I drove a Golf GTI in the late 1970s, I knew I had found the car I was looking for. Up to that point, I had had various Italian sporting coupes that were fun to drive but had horrendous build quality, poor reliability and rust problems. The smoothness, tractability and will-ingness to rev of the GTI’ s 1.6-litre engine were almost unbelievable after the hiccups of car-burettored Italian machinery, and the doors closed with a bank-vault quality that promised a lasting relationship. 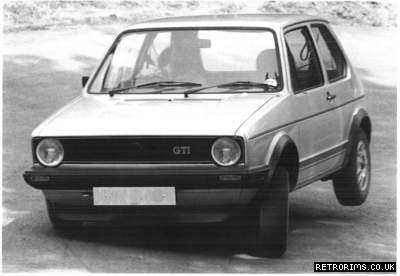 A Mk1 car showing the rear wheel lift characteristic of all GTIs under hard cornering. It looks more dramatic than it feels, and remains safe and controllable. What was immediately apparent was that this little nugget of a car was exactly as big as it had to be and had the handling and grip to match its performance. It was the perfect size to negotiate London traffic and nip into parking spaces that were denied to small BMWs and, at the same time, its hatchback with folding rear seats made it an extremely useful car for carrying ‘tools of the trade’ or simply for an extended tour of the Continent. No wonder then, that the GTI, especially in black, soon became the pet of the Chelsea and Kensington set in London and ultimately the supreme ‘yuppie’ car across the globe. That type-casting was most unfortunate though, for the GTI, tame enough as it was to perform mundane urban duties, really came into its own on the open road where its sharp handling, small size and superb power-to-weight ratio made it an agile cross-country runner. It was equally at home on motorways and could run nearly flat-out for hours on end thanks to a strong engine and an oil cooler. It was unfortunate that the body structure and drivetrain conspired to create a boom in the rear of the cabin which was irritating to rear seat passengers. This happened at about 70mph, the British speed-limit on motorways, and meant that more serene progress was made above or below this speed. The engine of the GTI 1600 felt almost unburstable. It would start first turn of the key even if the car had been lying idle for weeks and, once warmed through, would pull to the red-linelike a turbine, accompanied by a lovely rorty exhaust note. The gearchange quality was also excellent. The short stubby lever in the later five-speed cars was like a big flick-switch. With comparatively short movements across and up and down the box, it was a joy to blast this car along twisty A and B roads. The gear speeds were perfectly chosen: the five close ratios took up perfectly one after the other, producing one long blast of sustained acceleration if you did a standing-start to top speed run. Miss a gear, say if you went from third to fifth in normal driving to save on fuel, and you knew that the engine had dropped off the cam. In the more powerful l,800cc version, you could do this with impunity as the extra torque covered the ‘hole’ in the gear-box that resulted from skipping a gear. The GTI had two obvious dynamic failings, one minor and the other only manifest in right-hand-drive cars. The minor flaw in its dynamic makeup was that the rack-and-pinion steering was slightly vague about the straight ahead. Once through this ‘loose’ area though, it was nicely weighted and communicative. Right-hand-drive GTIs had to have a cross-linkage to couple the brake pedal to the servo on the left-hand side of the bulkhead. This had rather too many pivot points, and the whole arrangement introduced so much flexing and lost motion that the pedal feel on RI ID cars gave great concern to fast drivers. Many aftermarket tuners attempted various combinations of discs and pads, but it was not until the problem was tackled at source, by improving the linkage and then fitting a bigger servo and discs, that a solution was found. All cars based on the Mkl floorpan also tend to hit their bumpstops on hard bumps taken at speed. This seems to be a characteristic of the wheel travel and suspension design on the Mkl and is not cured even by fitting the progressively sprung Bilstein, Koni or Sachs spring and damper sport suspension. If the opposition was getting as fast or faster in terms of raw power, as 1982 drew to a close, VWreplied with the l,781cc engine, offering just 2bhp more but with more torque in the low and mid engine-speed ranges. The bigger engine was not quite as sweet as the 1600, but it delivered the goods in a more relaxed manner and made for an easier car to drive swiftly. That extra torque was very telling when exiting corners. I remember testing a Toyota MR2 at Castle Combe circuit, w here my times were just 1.5sec a lap slower than Chris Hodgetts, the Toyota saloon car racing champion in a Corolla GTi : the little Toyota w as as fast as the GTI to 60mph and had a higher top speed but, coming out ofthe bends, a colleague in a Mkl 1800 GTI was pulling away quite notice-ably, showing just how much torque counts in fast driving.